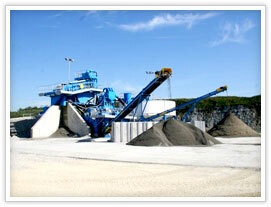 SBM Machinery proposes solutions for the processing and milling of barites. Thanks to a technology based on the interaction between different machines offered by SBM Machinery, it is possible to realize the dry milling of the barites, nowadays used as weighing additive in drilling fluids or muds for petroleum industry. The barites is a barium mineral (barium sulphate, BaSO4), with a medium-low Mohs hardness (3) and specific gravity (SG) of 4,5 kg/dm3. The main use of the mineral is towards the petroleum industry, in which it is use as weighing additive for the drilling muds (thanks to the high SG), in order to helps the earth crust drilling and reach the oil deposits. We take as example two samples of barites with different SG (4,1 kg/dm3 and 4,2 kg/dm3), milled only with pendular mill: at the end of the milling process, it comes out a material with an extreme fine grain size distribution, whose apparent gravity (calculated on a dm3 of milled material and not on a dm3 of ideal material) will be different between the sample with initial SG of 4,1 kg/dm3 and the one with initial SG of 4,2 kg/dm3. The final apparent gravity of material with that grain size distribution is absolutely identical to the one shown by types of barites with SG of 4,2 kg/dm3, milled only with the roller mill. The couple primary hammer mill + finishing roller mill proposed by SBM Machinery for the barites allows to get a milled material < 75 µm, that shows a grain size distribution less fine: this solution makes also the barites with SG of 4,1 kg/dm3 suitable for applications in the petroleum industry.